TACLOBAN CITY – The Philippine Statistics Authority, Regional Statistical Service Office VIII (PSA RSSO VIII) will conduct the January 2019 Labor Force Survey (LFS) and the 2018 Family Income and Expenditure Survey (FIES) – Visit 2 which will be carried out simultaneously on 14 January 2019. A total of 10,663 systematically and randomly selected sample households in Region VIII were identified as respondents. Around 364 Hired Statistical Researchers and Team Supervisors will be deployed across the region to conduct the interviews. The 2018 FIES-Visit 2, meanwhile, is the second of two rounds covering the second semester of 2018 (July to December) as reference period. 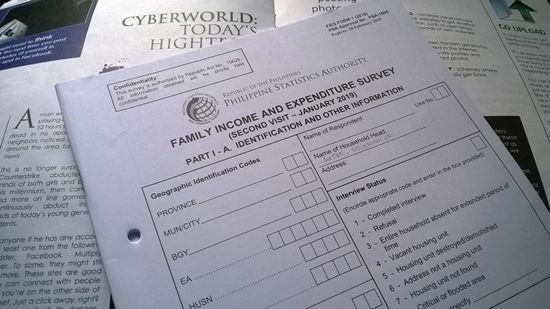 It is a nationwide survey of households conducted every three years which aims to gather data on family income and expenditure, to include among others, levels of consumption by item of expenditure as well as sources of income in cash and in kind. The results of FIES provide inputs in the estimation of poverty threshold and incidence. It also determines the levels of living and disparities in income of Filipino families, as well as their spending patterns.